You Do Not Have to Go It Alone! 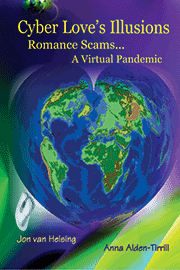 Victims of Romance Scams have, for a long time, asked for a book that would help them get through the emotional and practical issues they are facing. The emotional issues facing most Romance Scam victims are very similar to those faced by sexual assault victims, except there are no physical manifestations of their problem. Unfortunately, most social service and counseling professionals cannot begin to understand the trauma a scam victim goes through, and neither can most family members. Cyber Love's Illusions: The Healing Journey guides Romance Scam victims on a healing pathway, designed to deal with the major aspects of the trauma, including what important steps to take to get a sense of closure. The healing journey is a process. As in all recovery, whether physical, emotional or financial, healing does not occur overnight. It takes time and commitment. In this book, we give some victims a chance to tell their stories. We share what has worked for some in their own journey toward healing and recovery. We also share some practical guidelines for healing and recovery and some useful information. If you are a victim of a Romance Scam, are you heartbroken from grief? Are you devastated by the loss of the person you thought was your loved one? Are you bewildered by all the strong emotions and crazy feelings you have been going through? Are you wondering how you are ever going to survive? Are you tired of being stuck in such a complicated cycle of grief? Do you feel like you are on an emotional roller coaster and going around and around in circles, but getting nowhere? If you answered “YES” to any of these questions, you will benefit from reading this book. Consider it your Personal Grief Guidebook. The sad reality is that there is no “quick fix” to grief. There is no magic pill you can take that will immediately make you feel like your old self again. But, there are some effective and comfortable ways to help heal your broken heart. This book will provide you with some useful tools and the answers you have been looking for. Everyone’s grief process is unique. Not all scam victims employ the same coping styles. There’s no “one size fits all” approach to counseling a Romance Scam victim. But, you are sure to find something here of great value to you during your own personal healing journey. We hope this book will guide you through the dark maze known as grief and will help lighten your heavy burden, leading you gently towards successful resolution . . . and back to trusting and life once again. Grieving is a personal and highly individual experience. How people grieve and how long they grieve depend on many factors, including their personality and coping style, their life experience, their faith or belief system, and the nature of their loss. Just as we have different emotional reactions to the various events that happen in our lives, we also experience hurt, betrayal, grief, and loss in different ways. The important thing to remember is that there is no "right or wrong" way to feel or to grieve. There is a wide range of emotions that may be experienced. These emotions may be powerful, but in most cases, they are "normal" and healthy. Victims of a Romance Scam can expect to feel some or many of them as they naturally move through their own healing process at their own pace. We recommend that you read Cyber Love's Illusions: The Healing Journey in tandem with Cyber Love's Illusions: The Hollywood Syndrome and Cyber Love's Illusions: Romance Scams . . . A Virtual Pandemic. Click on the link to be taken to the Order Page where you can order this book or take advantage of our special prices on multiple books. There Is Hope for the Romance Scam Victim! © 2010 White Cottage Publishing Company, all rights reserved.